I spiced up a lot of my Halloween mail with some recently discovered Halloween paper tape - from Martha Stewart Crafts, of all places. I don't know if one is allowed to call this "washi tape" as it's not Japanese, but it is paper tape and tears essentially the same way. 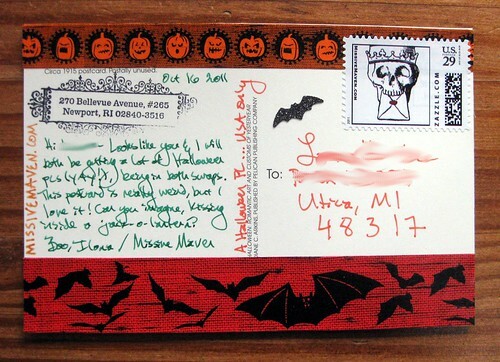 Of course the bat tape is my very favorite, and I found this Swap-bot Halloween postcard swap the perfect occasion to use one of my skull envelope stamps. A sparkly bat sticker, also by Martha Stewart (who knew her Halloween stuff was so great? I didn't! ), livens things up. More Halloween tape here, though these stickers are decidedly NOT Martha Stewart. 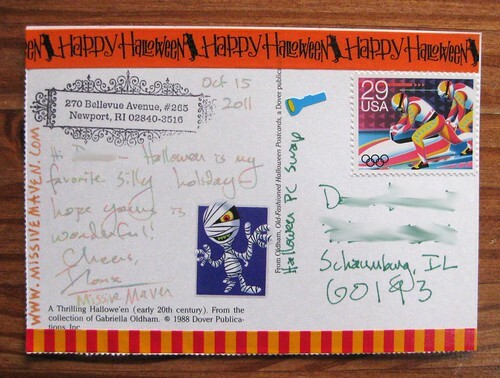 Finally, a shot of a bunch of Halloween postcards together before they went out for their swaps. I love these vintage reproductions! They came from three different postcard books: Halloween: Romantic Art and Customs of Yesteryear Postcard Book, Old-Fashioned Halloween Cards: 24 Cards (Dover Postcards), and Halloween Postcard Book by Darling & Company. 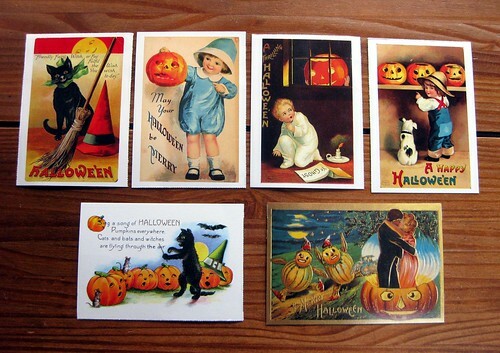 Very few are actually spooky, most are cute, and some are just downright weird, like the bottom right-hand corner card that shows a kissing couple standing in a Jack-o-lantern. If you find yourself in MA with time to visit Salem, there's a store near the Peabody Essex museum that has wonderful repro vintage cards. I really need to get out there again myself! I'd be happy to snag some for you next time I go if you'd like. They run 30 cents apiece and there is a really nice selection. Julie - I don't get up to Salem much, but if I do, I'll have to check out those cards... although I really have more postcards than I need already! Thanks for the offer, though.